Siem Reap is best known as the location for the amazing temple complex known as “Angkor Wat”. Angkor Wat is the largest religious monument in the entire world and was built as a Hindu temple but was subsequently turned into a Buddhist site of worship. Today, there is an interesting mixture of Hindu and Buddhist elements inside the complex, and even some active sites of worship for local Hindus and Buddhists exist to this day. Angkor Wat should definitely be on every serious traveler’s list of places to see, right up there along with the Giza Pyramids, the Great Wall of China and the statue of Christ the Redeemer in Rio De Janeiro. Siem Reap is the city nearest to this huge temple complex, about 4 miles south of the main Angkor Wat complex (although there are many other, less known and less visited temple complexes further north of Siem Reap as well) and anyone who visits Angkor Wat will need to stay in Siem Reap, as it is the only nearby town which really offers hotels and accommodation, as well as help with tours of the temple complex. Me, walking in front of an Angkor Wat temple! Angkor Wat can describe the main temple in the Angkor Wat complex, or the entire complex itself, which is freaking massive, covering over 500 acres of land. Any hotel in Siem Reap can help you actually get to the complex itself, usually by rickshaw, taxi, or on foot if you’re ambitious. Once there, you can buy tickets for entry that last anywhere from 1 day to 7 days, and which cost anywhere from 20 USD to 60 USD. When you get to the entrance, you must have your photo taken and it will be printed on your ticket, which you need to keep with you and carry on you at all times, as you will often be checked for your ticket before being allowed to enter some of the temples inside the complex. Also, fines are steep if you’re found to be wandering around the grounds without a proper ticket, or with a ticket who’s photo does not match your face. Don’t skimp here–just buy a damn ticket and know that the money you’re spending is going toward the upkeep of a beautiful UNESCO world heritage site and is well worth spending. Once you’ve gotten your entrance ticket, if you don’t already have a local guide and you want one, you can simply walk around and find a tout hanging around either outside the temple complex or just inside. As in India, at the Taj Mahal, these guides should be licensed by the state and will have a lanyard around their neck with their certification. Pick a guide who’s certified and agree on a fee before allowing him to take you around, otherwise at the end of the adventure, you’ll find yourself in an awkward and potentially expensive situation. Guides are not necessary, especially if you have your own guide book, but do remember that they are infinitely more familiar with the grounds than you are, and will help keep you from getting lost, and if you’re constrained by time, they can help you pick which sites are worth a visit and which ones to skip. I personally also like getting a local guide because I enjoy helping out a local who probably needs my money more than I do. A lot of Westerners see these guides as annoying or like beggars, but they are making a legitimate living and the certification to be a guide is not easy, so just remember that it’s not that expensive to hire a guide for the day (I paid 50 USD — 20USD price plus a 30USD tip) and it’s fun to have a local’s perspective on everything and someone you can ask questions regarding the monuments, instead of having to continually flip through a guide book. Bonus points include getting local tips for which restaurants are good in Siem Reap city and perhaps an invite to a local family dinner! Keep in mind that the Angkor Wat temple complex is HUGE! I cannot state this enough! I recommend buying a several day long ticket (you must use the ticket on consecutive days though, so a 3 day long ticket must be used 3 days in a row) because it’s pretty much impossible to see everything worth seeing in one day. Also, since the complex is so large, walking around it can get tiring, especially if you’re visiting in the heat and the humidity. There are plenty of modes of transport you can hire once inside the temple complex to help get you around–anywhere from bicycles to elephants, to golf carts. Take your pick of which you’d like, or choose to walk if you prefer. Everything is relatively cheap and easy to arrange; no need to do it in advance. Me, with temple dancers dressed up for photo ops! Also, be sure to grab a map of the complex so you don’t get lost, and enjoy spending the day or days getting lost in the beautiful carvings and huge ancient temples! Be sure to wear good walking shoes because even if you hire transport, you will still be walking often up and down stairs to ascend and descend temples, and often through the temples themselves. And bring a lot of memory cards for your camera as the entire complex is utterly gorgeous and you’ll want to take a ton of photos! There are few vendors inside the official temple complex, although there are some who sell t-shirts and rice paper rubbings of some of the carvings on the temple, which are beautiful by the way, and worth the 1-2USD it will cost you for them. There are also a few places which sell basic provisions like water and snacks, but no real places to eat and no camera stores or places selling memory cards, so just bring what you know you will need with you for the day before entering the area. A small note on getting to Siem Reap from Phnom Penh (capital city of Cambodia): I recommend a bus, because the journey is relatively short (5-6 hours), on good roads, and it’s fun to watch the countryside roll by and to experience riding a Cambodian bus. The tickets too, by bus, are pretty cheap (if I remember properly, around 10 USD one way, per person). Beware though, that there are two kinds of buses: VIP and non VIP. VIP buses are primarily for tourists only and have onboard amenities like a toilet, a TV which will play amazing Cambodian movies and the occasional Bollywood hit, and if you’re especially charming, they may even play a movie of your choice if you’re carrying the DVD with you (I watched The Dictator on my bus because I charmed the driver into letting me control the onboard DVD player and I had a bootlegged copy of the Dictator from Phnom Penh with me, cuz I travel prepared!). The best of these VIP buses is the Mekong Express, which I chose to travel with. I did see, at one of the rest stops, a bus called the Giant Ibis, which advertised onboard wifi and extra leg room, but I am always wary of “onboard wifi” seeing as how 90% of the buses in South America supposedly offer this but none of them actually ever have it. But if you’re into it, it may be worth checking out. Buses stop once for lunch and once more for a break to stretch one’s legs, and generally get into Siem Reap around sunset. Once you arrive, you can either have your Siem Reap hotel send a taxi to pick you up from the terminal (VIP buses have a separate terminal from non-VIP buses, so make sure you specify) or you can just grab a local tuk tuk from the station because many congregate in the area and are very accessible and cheap. However, if you have a lot of luggage arrange for a taxi in advance because tuk-tuks can’t handle a lot of luggage or large groups of people very well. From my memory, they do run night buses to Siem Reap from Phnom Penh as well, but I wouldn’t recommend those because I don’t think the security would be as tight and in general, it’s best to travel during the day through rural areas. 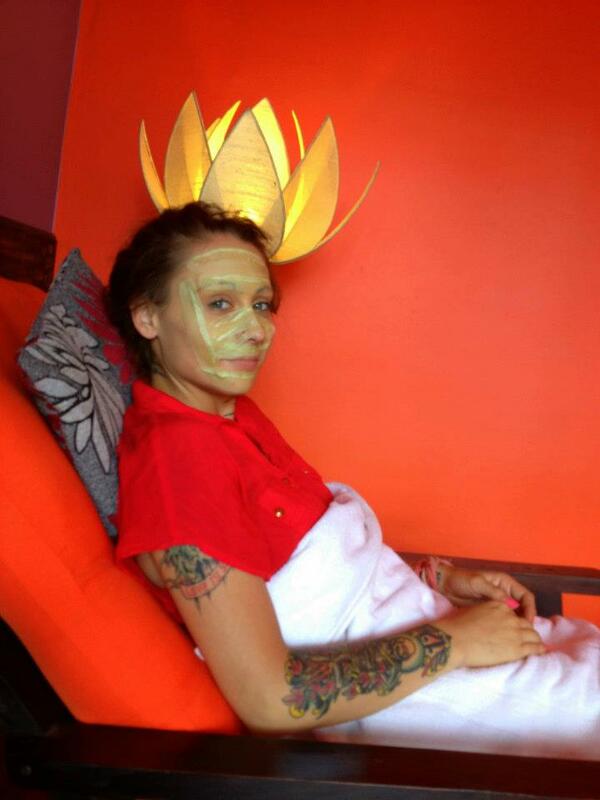 Getting a spa treatment at the Golden Temple Villa hotel. Also note that VIP buses only cost about 4-6USD more than non-VIP buses and are well worth the extra money for the extra amenities. If you’re super broke, take a non-VIP bus but do expect that you’re gonna be crammed in with the locals and it’s not going to be a fun ride. Fair warning. If you want to fly in, there are also many flights to and from Siem Reap, both internationally and domestically. Departing Siem Reap back to Phnom Penh, I flew out of the Siem Reap airport on Cambodia Angkor Air, and was pleasantly surprised at how organized, clean and efficient the airport was. They accommodated international flights from Vietnam, Laos, and Thailand, as well as mentioned, to local cities, mainly Phnom Penh. Mostly, the airport was full of tourists, because Siem Reap is mainly a tourist destination due to Angkor Wat. Tickets were right around 100USD for a one way, per person. I enjoyed traveling by bus there and by plane back, and recommend it to everyone as a way to experience a little bit of everything whilst traveling to Siem Reap. The city of Siem Reap has some interesting things to check out as well, so don’t forget to poke around the city before or after visiting Angkor Wat. The Cambodia Landmine Museum, founded in 1997 by an ex-child solider of the Khmer Rouge, is very interesting and well worth a visit. The Old Market area (including the old market itself, called Pshar Chas), Pub Street, and Alley West are the best places to hang out in Siem Reap after a long day of exploring the Angkor Wat temples. Pub Street is filled with awesome nightclubs and bars, as well as tasty local restaurants. Alley West has a bunch of boutique stores and art galleries, and the old market is filled with tons of local trinkets, stones, t-shirts, and all other forms of memorabilia and local household items. Things really don’t start to pick up in the Pub Street/Old Market area until after 5pm, so be sure to come after sundown for the best time. If you all are really lucky, I will dig out the footage of me breakdancing with a local 12 year old outside of the biggest club on Pub street! Obviously, I had an amazing time! Recommended Accommodation: Golden Temple Villa, $20-50/per night; email the hotel directly for booking, and you will probably be offered package rates which include free pick-up from the airport or bus terminal, a complimentary massage in their spa, complimentary drinks and snacks upon check in, and one free meal at their restaurant. They are very competitively priced and offer a beautiful room for the price and have most of the amenities of a 3-4 star hotel in the USA (including wifi, in room dining, and a full service bathroom and lovely bed). Request the balcony room. To See: Angkor Wat Temple Complex: “Angkor Passes” are sold in one-day ($20), three-day ($40) and seven-day ($60) blocks that must be used on consecutive days. Photo taken on the spot with free of charge is required at time of purchase. Visiting hours are 5:00AM – 6:00PM. Angkor Wat closes at 6:00PM, Banteay Srey closes at 5:00PM and Kbal Spean at 3:00PM. Always carry your ticket. It will be checked upon each park entry and at major temples. There is a significant fine for not possessing a valid ticket inside the park. A regular admission ticket is not required to visit Phnom Kulen, Koh Ker or Beng Melea, but there is a separate entrance fee of $20, $10 and $5, respectively. Transport: Mekong Express Bus: $13 per person, one way from Phnom Penh to Siem Reap. DVD player, on board bathroom, several stops for fresh air. Cambodia Angkor Air: $150 apx one way, per person from Phnom Penh to Siem Reap; around $350 round trip, per person. Cambodian Visa: $25 cost for eVisa, which saves you from having to stand in line and get a visa on arrival when arriving into Cambodia. Highly recommended; easy, fast, and efficient. Just cut out the eVisa and paste it into your passport. Conversely, a visa on arrival is $20, but expect long lines and potential complications. Ta Prohm, or the “Tomb Raider Temple”: footage shot by me as I was being guided through the complex by a local guide.